Saying what I said before in a paragraph. Crazy idea alert! When Jesus stands at the mountain site of pagan worship called the Gates of Hell and says “upon this rock I will build my church and the Gates of Hell will not overcome it” he may not have been talking primarily about the Pope. If a church is sick, the cure is in following Jesus closely. Forgive me for the rambling nonsense I offered up yesterday on the Ferns Report and all that depressing crap. 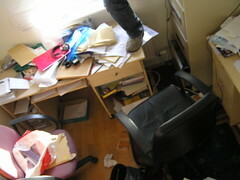 Those incoherent rantings can maybe be understood better when you consider the state of my office. How can a mind produce clear writing when there is battery acid leaking into the rabbit cage hiding underneath your pile of unfiltered notes? I didn’t even know I owned any batteries, nevermind a rabbit! My brother won another IFTA over the weekend. Congratulations brother! You keep making those moving pictures for the people of our fair land! Neither of these people are my brother, although they both look funny. The IFTAs, which I didn’t watch (I don’t even know if they were on the TV but I suspect TV awards were televised (though on TV3, of course, the station of crap only drug addicts and the bed-ridden will watch)) got quite a slagging in the papers. People indignantly wrote things like “They were meant to be Ireland’s answer to the Oscars but it was a list of c-list celebrities!” Do those columnists really think that the Irish answer to the Oscars would have a-list celebrities? What did you want? Tom Cruise and George Clooney agreeing to do a rap together in honour of the televisual extravaganza that is Nationwide? Bill Clinton coming to give a lifetime achievement award to Mick Lally? (“As you played Miley, he inspired me more than any other man as a leader and as a father…”) They are industry awards that happen to be on TV because they are the TV industry awards. If you had the mobile phone industry awards on TV, sure you’d get to see Stigmund but other than that, it would be a celebrity free zone. Except for a guest appearance by the Dandy Warhols. My brother isn’t a celebrity. Except in Sierra Leone where there is a bit of controversy about some diamonds. But his colleagues wanted to say, “That was some good camera pointing”. Fair play to all those IFTA boys and girls I say. I am in the gaseous dimension! Did you know that space has three dimensions? Kent Hovind told me and Dave today that space has three dimensions: solid, liquid and gas? That makes it just like time that has three dimensions which are the past, the present and the future. This is brand new info for me and I thank the eggheads over at Creation Science Lab for teaching it to me. My workmates hate me and as punishment I have to try and watch a bunch of Creation Science dvds. The first one today features the teachings of Kent Hovind who is famous as Dr Dino. His doctorate thesis was submitted to Patriot University and is just over a 100 pages long. It cites 12 chapters that have no content at all, has no title, is printed on dot matrix paper, features a great deal of mis-spellings (“shintu” Buddhism, “centrifical” force and we “immerged” from slime) and the university itself is accredited by a theological institute for $100. I think we gave it up when somehow he made an argument against evolution by comparing Rosie O’Donnell’s weight problems with gun control. I wish I was joking. I wish I was mis-representing things to make theistic evolution look more substantial but I am not. There is a website for cat haters called Stuff on my Cat. Go there and look at cats carrying loads. Burden those disloyal mofos and their hateful and poisonous emissions. If you want something that isn’t like the poisonous emissions of cats (Zoomtard is allergic to their sweat) and completely unlike the poison of modern Creation “Science”, drop by old man Stephen Jay Gould’s archive. Gould starred in a Simpsons episode. He also wrote about evolution in a way that even I could understand it. Finally, one last link. What if WWII was fought by geeks? This entry was posted on Thursday, November 10th, 2005 at 9:31 am and is filed under Cross Shaped Waffle. You can follow any responses to this entry through the RSS 2.0 feed. Both comments and pings are currently closed. I can’t say those DVDs thought me nothing. I can now flick a rubber band for miles. Thanks Hovind. If I attend one of your seminars, your own words may defeat you. Right in the eye!